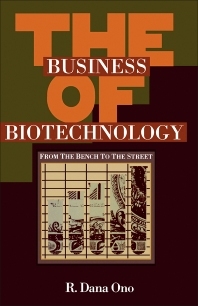 The Business of Biotechnology: From the Bench to the Street thoroughly examines the existing and future business challenges for biotechnology, providing a unique insight into the intricate web of critical factors with which biotechnology entrepreneurs must come to terms if they wish to be successful. The book begins with discussions of the evolution of biotechnology; entrepreneurship in the biotechnology industry; university-industry technology transfer process; and the life cycle of a biotechnology company. It considers the prospects for biotechnology, from the perspective of a venture capitalist and human resource practitioner. There are separate chapters that deal with the cloning and expression of recombinant gene products; developing strategies to reduce the cost-to-produce (CTP) therapeutic proteins; intellectual property protection; and the regulation of commercial biotechnology. The final chapters cover the marketing of biotechnology companies and products; the performance of biotechnology stocks; mergers and acquisitions in the biotechnology industry, and prospects for the Japanese and European biotechnology industry. Chapter 11 Biotechnology and the U.S. Government: The Pot at the End of the Rainbow? Chapter 17 Japan's Dilemma: Where and When?